Stock photo of Polar Bear, Ursus maritimus, on the icy fringes of Hudson Bay, Churchill, Manitoba, Canada. Polar Bear, Ursus maritimus, on the icy fringes of Hudson Bay, Churchill, Manitoba, Canada. 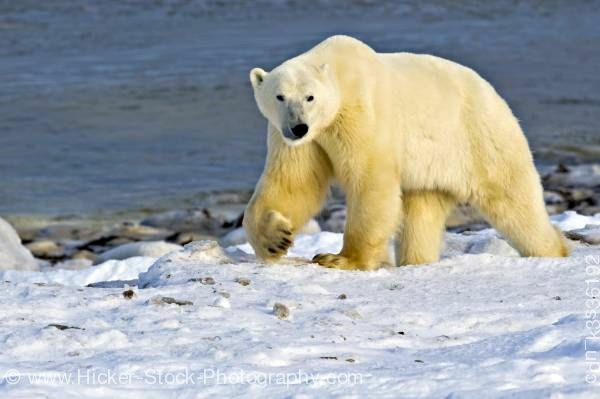 This stock photo shows Polar Bear, Ursus maritimus, as he walks on the icy fringes of Hudson Bay, Churchill, Manitoba, Canada. This adult polar bear walks along the snowy shoreline of the Hudson Bay. As he walks on the icy fringes of the bay, he lifts his right paw showing his large black claws. His soft furry ears and dark eyes are small compared to the large furry body. His muzzle is covered in black fur around his black nose up to his small dark eyes. The polar bear is covered in a soft white and tan fur with brown fur mixed in the fur of his thick legs. His fur has a layer of underfur and the outer layer is called guard hairs. The guard hairs are hollow and are transparent even though they look white or tan.